Something from the concession stand? When our oldest boy was two, we had time to watch movies. We would put one in and turn the lights down. While we watched, he would play nearby. One evening, as we were on the couch and our son was playing, something different happened. As many parents probably know, with kids there is sometimes cereal on the floor. This time there happened to be a Captain Crunch type. My son walked over and held out his hand, and, being the good dad I try to be, I accepted the crunch berries from him and didn’t think anything of it. 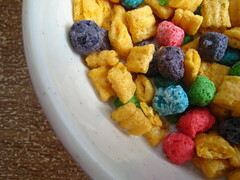 That is, until I realized the crunch berries were squishy. This prompted pausing the movie and turning on the light to find that the ‘berries’ were turdlets that had come from his fallen-off diaper. To this day I look first at what is being offered to me. Really???? I am going to be looking at everything super close now! Yes, and you definitely don’t want to put anything your child hands you in your mouth without inspecting it closely first! Oh dear. That would’ve put me off from Cap’n Crunch for the rest of my life. Imagine if he had unthinkingly popped it in his mouth! Bleh! At least he alerted his father to the problem before they got spread around! I don’t think anybody actually had the displeasure of tasting it, fortunately. Thanks for stopping by! I never have time for ironing either. It’s definitely among my least-favorite chores! Ew! But hilarious! We had an equally squishy moment this weekend. We went to Target to get goodies for our little guy, then to the grocery store. When we got there my hubby said he smelt something (which means, Mom check the diaper). So I took the little guy outta the carseat in the parking lot and just pulled open the back of the diaper to see. I didn’t need to see anything. My fingers had dipped into something squishy. So, we had an impromptu diaper change in the back of the car in the parking lot. But that wasn’t the hard part – it was getting the squishy stuff out from under my nails without a sink right there… fun fun! Ugh! That reminds me of a friend who had made cookies earlier in the day, so when she saw “chocolate” on her fingers, she figured she could just lick it off. It wasn’t chocolate!